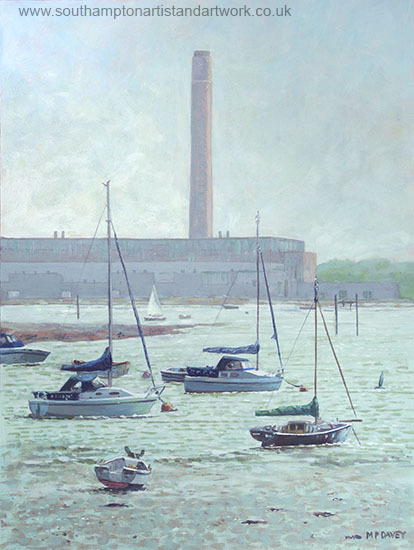 This painting of an area in Hampshire features a scene from Warsash looking across Southampton Water to the large power station at Fawley. Behind the 1971 built power station, is the start of the New Forest. The boats in the foreground rest on the mud banks of the River Hamble which intersects at this point with Southampton Water, a very busy shipping route that leads to the Solent. The power station is a famous landmark in the area and the chimney is 650ft tall. The power station closed in 2013 so the distinctive and visible icon for miles will eventually disappear when demolition is completed in the future. The painting is created on heavy paper sized at 12” x 16” and painted in acrylics during January 2016.